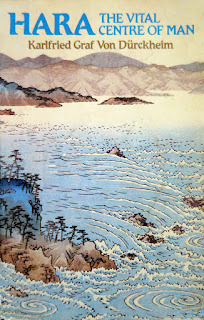 Zen, Meditation and Hypnotherapy: Hara: or The One Point in the Lower Abdomen. 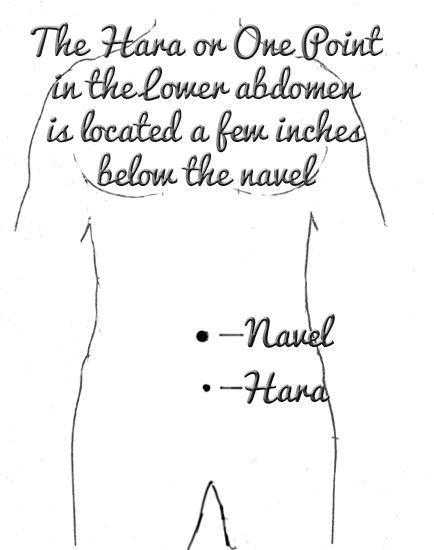 Hara: or The One Point in the Lower Abdomen. Back in the 1980s, I attended a martial art class in Ki-Aikido and this was the first time I ever learned of the value of what our Sensei (teacher) called, ‘the one point in the lower abdomen’. 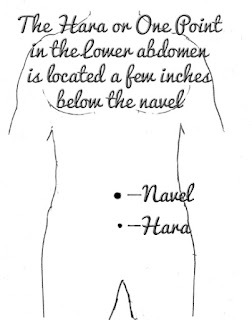 We were instructed to focus on a point in the lower abdomen a few inches below the navel and to imagine that we were breathing through the lungs and downwards into the ‘one point’ whilst sitting in seiza posture for around 15 minutes. First, we were instructed to slowly and fully inhale into the one point when the sensei clapped two pieces of wood together, then when fully inhaled to wait and hold the breath in until another clap of the wooden blocks and then pay attention whilst slowly exhaling with control and focus. Then again, fully exhaled, we would wait for the clap of the wooden blocks, to signal us to inhale slowly again until the lungs were full. This process of the clapping of the wooden blogs at the end of each inhalation and exhalation was repeated over and over again, for the duration of about 15 minutes. I slipped up once or twice and made one or two gasps for air particularly on the holding of the exhaled breath. But after a bit of practice, with an occasional reminder from our sensei to keep the mind anchored in the one point, I found I had more control and successfully kept time with the clapping of the wooden blocks. Our Sensei referred to this as the ‘ki breathing’ and ‘keeping the one point’ was very important. remember. And then the lesson moved on to practising a series of Ki-aikido defensive moves and whilst I was holding my mind focused in the one point, it was demonstrated to me just how strong the body is without tensing and I learned how to use ki (also known as life-force, chi, prana etc.) and a bare minimum of muscle power, which is the fundamental art of ki-aikido that I will blog about at a later date. For this post, I will focus on the value of developing hara-consciousness. It is the hara that my ki-aikido sensei referred to as the “one point”. And keeping one point during one’s daily life was the purpose of the ki-aikido lessons on the mat. And the mind would forget quite often in those early days. The mind is always challenged in such Zen-like exercises. My Early Experiencing of Hara Focus in Daily Life. One of the first things I became aware of was that where I would normally feel bored with nothing to do, I would breath (with a natural rhythm, not deeply) into the hara and the boredom disappeared. It was simply a case that there was nothing to do but simply BE. My awareness of body and mind was gradually expanding and any division of body and mind I had before was disappearing and I had insights into this at various times of complete co-ordination of mind and body... Mind and body as one. At night I could not help when going to sleep, to lay back and focus on breathing into the hara and not long after awakening the next morning, I would more than often notice that hara-consciousness was there without effort. I was aware of hara completely naturally. I had already been a Zen practitioner for quite some time practising regular daily zazen by following the breaths, and I was rapidly becoming aware that my ki-aikido lessons were in fact almost identical to the practice of zazen. Ki-aikido was a martial art that was a spiritual discipline, more than war-like. Yet a very effective and powerful defence against aggression should it be met, but for the most part, the ‘combat’ that we engaged in in the dojo, was more concerned with the testing the strength of our developing ki, than defending oneself from an attack. In Japan the hara is considered to be the primal centre of man – the centre of his very being, that has great spiritual and physical strength. And by focusing one’s mind into the hara, an individual can actually prove to him/herself, the truth of the above statement if he/she practises the discipline by getting into the habit of being hara-focused and ‘coming from the hara’ in all that is done in his/her daily life. Experiencing the Value of Hara Practice in Daily Life. So walking, painting, playing golf, or just sitting and standing.. remember hara. Remember one point. Say ‘hara’ or ‘one point’ in your mind constantly to remind yourself of this centre, and take note of any differences in consciousness you may experience. Don’t take the words here and blindly believe in them, it is about practise and therefore, seeing it for yourself. It is very likely that your resulting experiences may be entirely different to mine as I have here, but there will be something to experience if you practice. Feel free to share in the comments below. Hara. The Vital Centre of Man by Karlfried Graf Von Dürckheim, os a valuable book in hara that I have had on my bookshelf for around 35 years or more now. It is no longer in print, but at the time of writing, I have found that it is available on Amazon. Click here or on the first picture at the top of this page for reviews of this book and/or more information.